One year after NAFTA talks began, the odds of an accelerated conclusion before the end of the summer appeared as mixed as ever on Thursday. Exactly one year after NAFTA talks began, the odds of an accelerated conclusion before the end of the summer appeared as mixed as ever on Thursday. 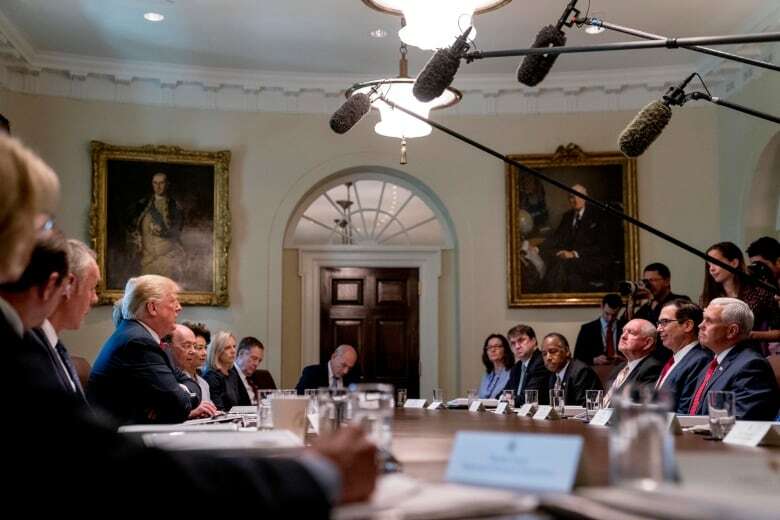 U.S. President Donald Trump staged a photo opportunity with his cabinet members and offered his take on the renegotiation of the North American Free Trade Agreement (NAFTA). "I'm in no rush. We want to make the right deal," he said, backing off expectations that an American deal was imminent with Mexico, as two-way talks persevere through their fourth week. Trump then called on his trade representative, Robert Lighthizer, to share with the assembled media the progress the administration had made. "I'm hopeful that in the next several days we'll have a breakthrough," Lighthizer said. "There are still some difficult issues to work through, as there always are at the end." Trump then interrupted his top trade official. "If you don't have a breakthrough, as you call it, don't do the deal," he said. "We have much better alternatives than that, you understand? So if you can't make the right deal, don't make it, all right? You know that. I only tell him that every day." Lighthizer said he could attest to the fact that the president tells him that every day. "But I think in this particular case the best alternative may be to get a good agreement. And I think there's a possibility of that," the trade representative said. "I hope once we get one with Mexico then Canada will come along. I feel reasonably good about that." After Lighthizer and Trump spoke of America's progress negotiating small things — "singles," Lighthizer called them, reaching for a baseball term — with other countries, Trump, arms-crossed by this point, circled back to Canada. "We're not negotiating with Canada right now," he said, apparently referring to the fact that Canadian negotiators have not been part of official talks since before negotiations broke for Mexico's presidential election in July. But Lighthizer's counterpart, Foreign Affairs Minister Chrystia Freeland, told reporters earlier this summer she'd been speaking to the U.S. trade representative over the phone to stay in touch with the negotiations. CBC News asked Freeland's spokesperson, Adam Austen, direct questions as to when the two last spoke and when or under what circumstances Canada was expecting to return to the table. "Minister Freeland, Ambassador MacNaughton and the Canadian negotiating team are in regular contact with their counterparts and we look forward to continuing these important discussions in the coming weeks," he wrote. 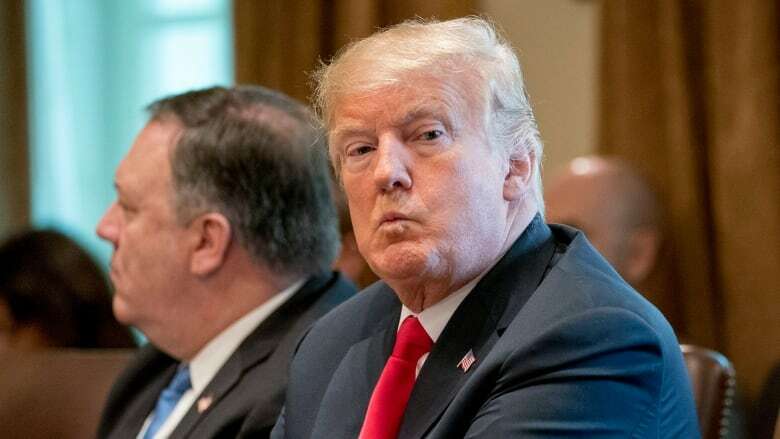 Trump has threatened to levy a 25 per cent tariff on Canadian automobile imports if Canada doesn't warm up to a better deal for America. "Their tariffs are too high; their barriers are too strong. So we're not even talking to them right now," Trump said of Canada, as the cameras rolled. "We'll see how that works out. It will only work out in our favour." In fact, prior to the introduction of U.S. steel and aluminum tariffs in May — and Canada's corresponding retaliatory tariffs July 1 — 99 per cent of the trade between Canada and the U.S. was tariff-free, thanks to NAFTA. Trump is under pressure from U.S. farmers who are furious at his administration for pulling out of the Trans-Pacific Partnership trade deal, which cost Americans market access they'd negotiated in not only Canada but also key Asian economies like Japan. Trump's escalating tariff strategy also has triggered retaliatory tariffs from China and elsewhere that put U.S. farm commodities at a price disadvantage around the world. "Our farmers are brave and they're great patriots," Trump said. "China sort of attacked our farmers by trying not to buy from our farmers. They know the farmers like Trump, and I like them. I love them." Trump then returned to a now-familiar complaint: how hard it is to sell dairy products in Canada. Its "tariffs of 275 per cent" make it "ridiculous and impossible," he said. "But we're taking care of that situation pretty easily." In fact, the U.S. already sells more dairy products to Canada than it buys. The kind of tariff Trump's referring to here only limits the relatively small volume of American trade with Canada's supply-managed agriculture sectors. On Tuesday, Quebec's chief NAFTA negotiator, Raymond Bachand, told CBC News Network's Power & Politics that he wasn't worried at all about Canada not being part of the August conversation, because the only subject being discussed was automobiles. Canada and the U.S. have similar negotiating positions for NAFTA's automotive chapter, owing to the heavily-integrated nature of the two countries' industries. "All the major subjects left … are [being] held off until the automobile [issue] is resolved," Bachand said, saying the Americans have blocked progress on anything else. 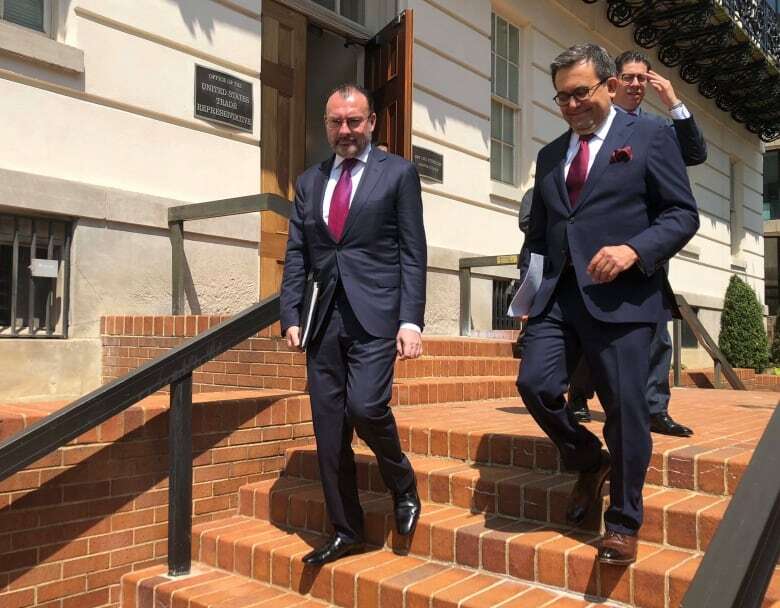 Mexican officials had been hoping to accelerate negotiations and reach at least an agreement in principle by Aug. 25, in order for the trio to be able to sign something before Mexico's government changes hands on Dec. 1. Mexico has committed to not concluding anything until Canada returns to the negotiating table. "Everybody has got to show flexibility," he told reporters. The current U.S. Congress has already missed its window for approving a revised deal. According to the enabling legislation governing Lighthizer's negotiation, the ways and means and finance committees must be notified of potential changes to U.S. trade remedy laws 180 days before entering an agreement, and Congress must be notified 90 days before entering an agreement, so the U.S. International Trade Commission can assess it. That means that even if a deal is reached shortly, the Congress that will vote on it is the one that will be elected this November. Should a significant number of seats change hands, the kind of agreement that may be required to pass the next Congress may not be the same as one that could have appealed to the priorities of the present office holders. Uncertainty over the outcome of the U.S. mid-term elections may give the Trump administration pause before finalizing anything over the next few months. Congress approved a trilateral negotiation — it has not authorized a bilateral deal between only two of the three NAFTA partners.